NEW YORK - Aug. 22, 2018 - PRLog -- Excel International Fashion Week New York (EIFWNY) is a series of luxurious and charitable events that will be held in Manhattan, New York during kickoff of New York Fashion Week from August 31st, 2018 to September 3rd, 2018. According to Bill de Blasio, Mayor of New York, "New York's incredible artistic landscape incorporates the customs of people from across the globe, and our thriving and diverse fashion sector is a great source of pride for the five boroughs". Featuring fashions and designers from across Africa, Excel International Fashion Week will celebrate this vital industry and Africa's rich and diverse heritage. With runway shows, exhibition booths, opportunities for networking, and educational seminars, this exciting event promotes cross-cultural exchange, while also raising critical funding for KDE Disability Africa Foundation and providing participants with the chance to support the United Nation's Sustainable Development Goals. "I am proud to applaud this event's organizers and supporters for uniting New Yorkers of all backgrounds in shared appreciation of talented designers who are shaping the future of fashion and for working to improve quality of life for people around the world." states the Mayor. The EIFWNY event producers are: KDE Disability Africa Foundation (501C3 non-profit organization founded to improve the lives of people with disabilities in Africa and the US) and Excel Global Media Group (an accredited media enterprise of global repute). 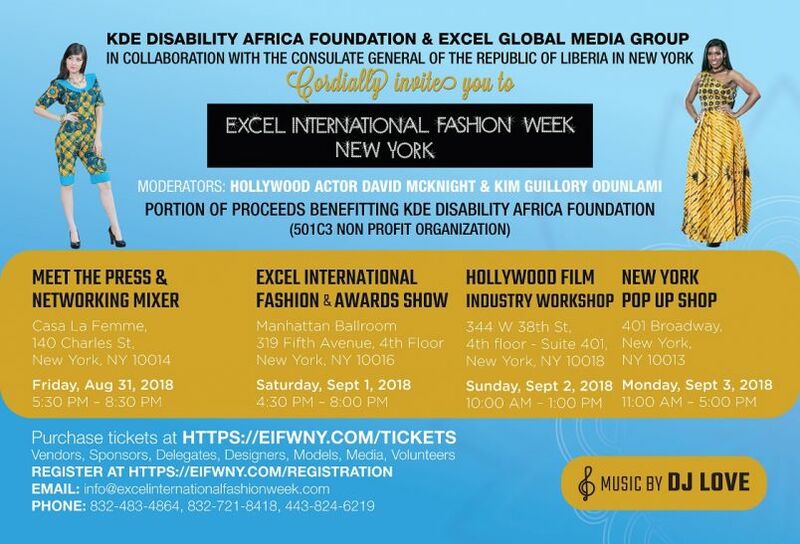 Kimma Wreh (President, KDE Disability Africa Foundation) and Mr. Boniface Ihiasota (CEO of Excel Global Media Group) launched Excel International Fashion Week New York as a platform to project African fashion, culture and tourism in New York, the world's fashion leader. Proceeds will go towards KDE Disability Africa Foundation, the Tuan Wreh Fashion Institute (non-profit fashion training program in Liberia), and Culturally Yours Int'l (501C3 non-profit organization benefiting youth and children in Kenya). Excel International Fashion Week New York will include Meet The Press & Networking Mixer – Aug. 31, 2018 at Casa La Femme, 140 Charles St, New York, NY 10014; Excel International Fashion & Award Show – Sept. 1, 2018 at Manhattan Ballroom, 319 Fifth Avenue, 4th Floor, New York NY 10016; Hollywood Movie Industry Seminar – Sept. 2, 2018 at 344 W 38th St, 4th Floor - Suite 401, New York, NY 10018; and New York, Pop Up Shop – Sept. 3, 2018 at 401 Broadway, #406, New York, NY 10013. • Award individuals for leadership, philanthropy, public service, entrepreneurship, etc. The award nominees for EXCEL LEADERSHIP AWARD include New York city Mayor Bill de Blasio; Hon. Phillip Kramer, Mayor, Township of Franklin, New Jersey; Hon. Rudolph E. Sherman Jr., Consul General of the Republic of Liberia in New York; Ambassador Benaoyagha B.M. Okoyen, Consul General of the Federal Republic of Nigeria in New York; His Excellency, Alhaji Ibrahim Hassan Dankwambo, Executive Governor of Gombe State, Nigeria; His Excellency, Chief Willie Obiano,The Executive Governor of Anambra State, Nigeria; Hon. Charles Onyejiaka, Councilman 3rd Ward, Township of Franklin, New Jersey; Chief Michael Okechukwu Amuzie, New Jersey; and Nyerere Chinenye Anyim, Nigeria, . The award nominees for EXCEL KDE HUMANITARIAN AWARD include Mrs. Clar Marie Weah, First Lady, Republic of Liberia; H.E. Djene Kaba Conde, First Lady, Republic of Guinea; His Royal Highness, HRH Dr. Apollos Chu, Rivers State, Nigeria; MacDella Cooper, MacDella Cooper Foundation, Liberia; Dr. Mrs. Anthonia Uche Umeh, National President & Founder, Anambra State Association Women in USA; Chief Mrs. Bridget Akasie, Founder & Grand Patron Umuada Igbo; Nze Chinasa Madumere, President, Imo State Congress of America; Chris Chima Nwachuwu & Annette Ijeoma Nwachuwu, among others. The award nominees for EXCEL ENTERTAINMENT - LIFETIME ACHIEVEMENT AWARD are: Hollywood Actor David McKnight; Nollywood Actor Mr. Osita Iheme; and Nollywood Actor Mr. Chinedu Ikedieze. The award nominee for EXCEL FASHION ICON AWARD is Gboea Flumo, Miss Africa USA 2018 – 2019, Miss Liberia USA 2018. The Award Presentation ceremony will be held at Excel International Fashion & Awards Show on Saturday, September 1, 2018 in Manhattan New York during Excel International Fashion Week New York which will showcase excellence, fashion, culture, and uniqueness (focus on Africa). The event will attract attendance from select African leaders, United Nations dignitaries, public sector leaders, business executives, education leaders, non-profit organizations, top designers, local and international media, pageant queens, etc. The Guest Speaker is Hon. Rudolph E. Sherman Jr., Consul General of the Republic of Liberia in New York. The Moderators are Hollywood Actor David McKnight and Kim Guillory Odunlami (Leadership Strategist). The designers are Culture Trees (New York), House of Lamaica Couture (Florida), FashPhiletta Designs (Liberia), TeKay Designs (Liberia), Queen Of The Brides, Fall Provs (Senegal), Lileth Couture (Florida) and Moto's Boutique (Texas). House of Lamaica Couture brings a taste of new and fresh fashion and style, and one of a kind pieces such as handbags and necklaces. FashPhiletta Designs specializes in blends of stylish African wear accompanied with European silhouettes; and will showcase "The Cross Over" collection of evening and semi-formal wear exuding Elegance and Exquisiteness. Culture Trees is a collection of premium wearables infused with culture. The designs are filled with bodacious colors and unique patterns that celebrate the royal you. The collection will ignite your sense of being! TeKay Designs (an international fashion label) will present the "Pride of Liberia" collection comprising cocktail and evening attire infusing tie dye, Ankara, lace and satin for a rainbow of color. Lileth Couture will present a denim wear collection of trendy denim mixed with lace for an eclectic look. Fall Provs is a Senegalese Fashion Designer and a fashion label that blends African esthetics with European designs. Kimma Wreh, Executive Producer of Excel International Fashion Week New York is an award-winning Fashion Designer, and founder of TeKay Designs (an international fashion label founded in 1998) with manufacturing in Houston and West Africa. "After concluding my global tour of showcasing African fashions, I wanted a platform to promote ethnic apparel and support in marketing fashions from around world while providing vocational fashion training via humanitarian initiatives. Recently popular cinema has focused on cultures and have promoted cultural pride in wearing ethnic fashions. Our 'show-n-sell' platform is created to help designers of ethnic fashions capture this market trend." explains Kimma Wreh. According to Mr. Boniface Ihiasota (CEO, Excel Global Media Group and Publisher of Excel Magazine International), "We are including a Models of Diversity segment in the Excel International Fashion & Award Show in loving memory of Deborah Grayson Carpenter who was a founding board member of KDE Disability Africa Foundation. This was her dream to be on the runway in New York Fashion Week. We welcome models from all walks of life including models with disabilities to showcase on the runway." For more information on Excel International Fashion Week New York 2018, please visit our official website: https://excelinternationalfashionweek.com. : Excel Global Media Group Inc.